Every once in a while, I put on my ears and go to a poetry open mike. I’ve been doing this for years. I’ve sipped coffee in countless cafés, fidgeted on innumerable uncomfortable chairs, and pondered art—the visual and the spoken kind—while poets belted out their work at galleries. I even co-hosted an open mike for three years, which was like planning a birthday party every month: I always worried that no one would come, and then people did, and we usually had a blast. And after all that, I have a confession to make: I hate open mikes. It’s no idle question. It’s something I think about a lot, because, God help me, a few weeks later I’m sitting there, doing it again. Part of the answer is that open mikes have another side: a kind of beauty that comes from randomness. I might, for instance, see an unexpected genius come wandering in off the street, with dog-eared pages clutched in one hand. Or someone might take a form—a sonnet or villanelle—and turn it inside out, exposing a whole new world of possibilities. Or there might be a shy high school girl who gets up and reads for the first time in her life, and is actually…really…good. Some nights, there are a lot of these moments. Some nights, there are none. But, like flashes of gold that a prospector sees in a muddy creek, they’re enough to keep me coming back. Mostly, though, I go to open mikes because my friends go to them. And the more I go, the more friends I make, and then the whole thing begins to emit a gravitational force of friendship. I also go because I like to see what’s going on with poetry—what’s new and surprising. Poetry is one of those fields where the breakthroughs can happen at any level, to anyone. Some of them flare and die out, but some of them take hold—because someone else was listening, and liked it. Thus the giant life form of poetry grows, cell by cell. So back I go, full of caffeine so I don’t nod off during the long bits, and armed with a couple of poems in my pocket. God knows who’s nodding off during my five minutes, but they’re kind enough to let me read, and I return the favor. And there we are, once again, throwing our poems in the creek. And hoping a few will shine. 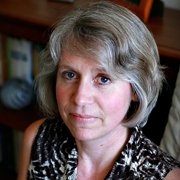 Amy Miller’s poetry has appeared in Bellingham Review, Nimrod, Northwest Review, Permafrost, Rattle, and ZYZZYVA. Her chapbooks include I Am on a River and Cannot Answer (BOAAT Press), Rough House (White Knuckle Press), and White Noise Lullaby, and she won the Cultural Center of Cape Cod National Poetry Competition, judged by Tony Hoagland. For three years she co-hosted the Piccolo Poetry Series, the largest poetry open mike on the San Francisco Peninsula. She now lives in Ashland, Oregon, and blogs at writers-island.blogspot.com.